The fish's window can be clearly seen when a fish takes your fly at or near the surface. This is indicated by a subtle rise, a swirling ring or an aggressive splash. The tendency for beginners is to cast to the surface ring, but this is a mistake. 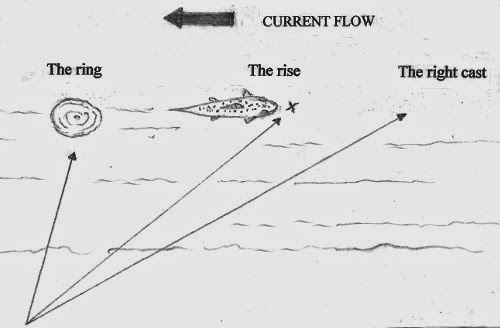 Because of the downstream current, the ring misconstrues the actual feeding station of a fish, since the ring has moved down with the current. Therefore, depending on the depth of the fish and current speed--you have to make a calculated guess here--the cast must be placed ahead of the ring from 3 to 6 feet so the fly will drift into the fish's window. This may take a while to adjust to, but once you've mastered the distance, it should result in more hookups. How fish see a surface fly..